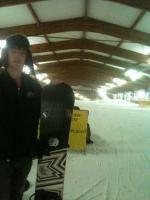 Snowboarding!. The day before Izaacs birthday. We go to go snowboarding plus buffet food and drink for 20€ for the whole day. We didn't end up getting there til bout 12. But it was ok because the place was open til 10 and by about 8 we had had enough snowborading. It was really fun but quite painful. Especially for me, I was probably the worst at it and I fell over alot. Also it didn't help we didn't have any gloves. We tool our socks off and put them on our hands but it was still pretty harsh. We all made it down the big hill at the end of the day tho. So at least we achieved that.